Having a fast loading blog is a must if you want to retain readers. Since the next blog is only a mouse click away for them, you owe it to yourself to ensure your blog is as fast as possible. Studies have shown that you risk losing the majority of your potential visitors if you made them wait longer than 8 to 10 seconds. If you can’t make your pages to load fully in less then 8 seconds, you should optimize them so that your main content and important elements are loaded within that time period. There are several online tools that could help you find out the loading speed of your blog, and one of my personal favorites is the tool from Pingdom. You can then determine the total number of objects, their size as well as the time it takes for each object to load. This helps you identify objects that are slowing down your page. To reduce the loading time of your pages, the first thing you have to pay attention to is the quality of your web host. There’s no point having the leanest page of all time if your blog is hosted on a slow server in the first place. When it comes to choosing a web hosting service, avoid cheap services that put quality in the back seat. When your blog is offline as frequent as the commercials aired during your favorite TV show, you’ll not only lose visitors but risk having your blog removed from Google index. Obviously no web hosting company will admit that their service is crap. But you can find that out by googling the company name and visiting the popular web hosting forums and read what others are saying about the company. Beginning April 2008, Google has taken landing page load time into account when calculating your page Quality score. If you are using AdWords to advertise your blog, beware that you may be penalized for slow load time and may be paying more than you should. Therefore it’s important to make sure you have optimized your page load time as much as possible. Talking about web hosting, currently I’m using HostGator to host Sabahan.com on my own server. So far, they’ve been quite reliable and I am happy with the service. The only problem I had was during the initial transfer when I had to move many websites from my old server to the new one. But once that’s over, everything has been working nicely. If you are looking for a reliable web hosting service, I highly recommend Hostgator. Does it contains excessive nested tables and repetitive HTML code? Find a template that uses separate tables where ever possible. Avoid a template that nested tables for the header, content, footer etc. A page generally won’t load until the server processes the whole code. A slow loading image in the footer will delay the loading time for the entire page. The good news is that you should be able to find a template that uses CSS tables fully which will improve your page load time. In addition, check for unwanted tags and unoptimized HTML codes that slow down your load time. Does it has an optimum content area? Having a template with two or three sidebars with many elements inside them will slow down the page load time. Instead, look for a template that maximizes the content area to reduce load time and improve your page readability. While your template might look nice, it’s not worth it if no one is willing wait around long enough for the whole enchilada to load. Most people come to your blog to read your content and not to be mused by your template design. While having a pretty template is definitely a plus, avoid a template that doesn’t optimize the graphic and flash animation and other script files. Is the design too complicated? Just look at Google.com and realize that a simple design usually equates to fast loading page. People like fast loading page and it’s important to find a template that balance functionality and good look. Make the cache directory writable by setting its permission to 755 or 777. I haven’t personally tested the WordPress built-in caching mechanism yet. Instead I’ve installed WP Super Cache for this purpose. The native WordPress caching basically reduces the database queries that are performed on every page load by catching them. That means less demand on your MySQL database but it will still generate your pages dynamically. WP Super Cache goes one step further by generating static HTML file from your dynamic pages. After a HTML file is generated, your web server will serve that file instead of processing the comparatively more resource demanding WordPress PHP scripts to generate pages. <?php echo get_num_queries(); ?> queries. After installing WP Super Cache, the time it takes to process 49 database queries on Sabahan.com main page is reduced from 2-3 seconds to less than 0.8-0.3 seconds. Now, at first glance, that may not seem much but it will add up when you blog is visited by thousands of visitors daily. Actually this information is immaterial because once you have installed WP Super Cache, no database queries are made since the users are being served static HTML. But that’s only true for users who are not logged in, users who have not left a comment on your blog or uses who have not viewed a password protected post. That means you as the admin will still be working with dynamic pages and not cache pages. Why? If you are interested to learn more, I suggest you read the article from the developer’s blog to understand how it works. Most blogs, including Sabahan.com that only get a couple of hundreds of visitors per day probably doesn’t need to install this plugin. But when it comes to improving your page load time, there’s no harm installing it. Besides, your blog will be better prepared to cope with the spike in traffic in the event that it gets dugg or slashdotted. Another reason why you might want to install this plugin is if your blog is hosted on a shared and slow server or your blog performs excessive database queries due to several inefficient plugins (although in such case, I suggest you replace the problematic plugins with a more efficient ones). While the installation isn’t as straight forward as activating the WordPress native cache mechanism, as long as you follow the instructions, you’ll be up and running in a few minutes. 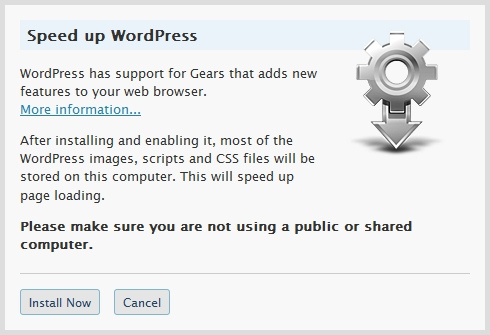 There’s a new feature in WordPress 2.6 that allows you to speed up your blogging experience using a browser addon called Google Gear. It enables web applications such as Google Readers, Gmail, and Google Docs and now WordPress feel more like an offline application. This is achieved by storing information on your computer locally allowing you to read, edit and update data from the Internet without actually being connected. In case of WordPress, dialog such as the Add Media function will load faster as you’ll be loading images and running scripts locally. Unless you already have a fast Internet connection, you should notice a speed increase making your blogging experience more pleasant. If you look at the top right hand side of your Dashboard, you should find a link called “Turbo”. If you don’t and you are using WordPress 2.6, check that you are using the latest version of Ozh Admin Drop Down Menu plugin currently at 2.2. This plugin modifies your menu and the old version doesn’t work properly with WordPress 2.6. When everything is in order, install Google Gears if you haven’t already done so and then click on the Turbo link. Gears will download around 200 files and store them on your PC. These tips are by no means definitive and complete. As each blogger has his/her own needs and unique audience to cater, you’ll have to adapt them accordingly. One thing for sure, as our Internet connection continues to improve, we will enjoy more flexibility in presenting our content in a way that best serve our readers’ interest. Update: I’ve just noticed the WP PostViews plugin that I’m using to count post views is no longer working after installing the WP Super Cache plugin and hence the low page view count on this post. This is another caveat for using the plugin where dynamic content will only refresh or be updated when the cached pages are refreshed or viewed by certain users when the page is not actually cached. I really should start using wordpress cache, but I am afraid to, because I’ve always had the impression that it was too hard to use, lol. It measure loading speed of page and it’s requisites (images/js/css) like browsers do and shows nice detailed chart – so you can easily spot bottlenecks. Also very useful thing is that this tool is able to verify network quality of your server (packet loss level and ping delays). JOhn Chow has the slowest page loading time and yet his readers are getting more addicted to him. i noticed mega improvement on just reducing the images on the front page. Well, acceptable to me. Such valuable tips dude.. really appreciate it. Love the tools man. Wooh!! Really good tips ere man. The Pingdom Tools really helpful.. Thanks for sharing!